You will rarely find four more distinctive and different artists together in the same room than at I love London, the exhibition opening at Burgh House in Hampstead on June 13th. Ranging from delicate studies of London’s domestic architecture to dramatic views of London in the Blitz, this exhibition provides cultural clash and plenty of enjoyable surprises. We describe this exhibition as “different views of an ever-changing city” the exhibition features two artists who are already well known in this part of London and two who are appearing here for the first time. In age, style and experience these artists are as diverse as the paintings on display. 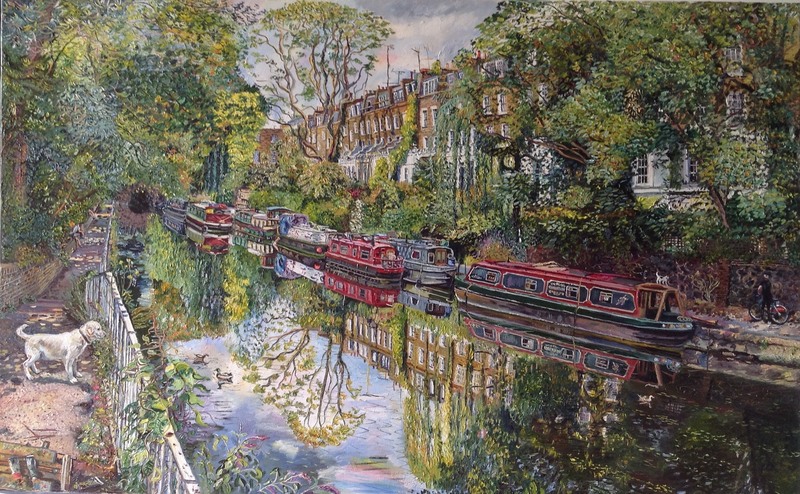 Currently the best known in North London is Melissa Scott-Miller, whose oil paintings take delight in the smallest details of the city environment, be it the mellow brickwork, the shady canals or the eccentric anarchy of back gardens. She never tries to prettify her subject; she shows the city warts and all: the cracked walls and pavements, untidy flowerbeds, dustbins – and the result is a delightfully honest portrait that is all the more beautiful. A member of the New English Art Club and the Royal Society of Portrait Painters, Melissa grew up in Kensington and now lives in Islington, and both feature large in her work. As does her dog Joey, her constant companion when painting in the open air, as Melissa does most days of the year. Daniel Preece, a prize-winning graduate of the Slade, portrays a city illuminated by electrical light, where day and night seem to merge and where you can’t be sure if the colours are natural or completely artificial. 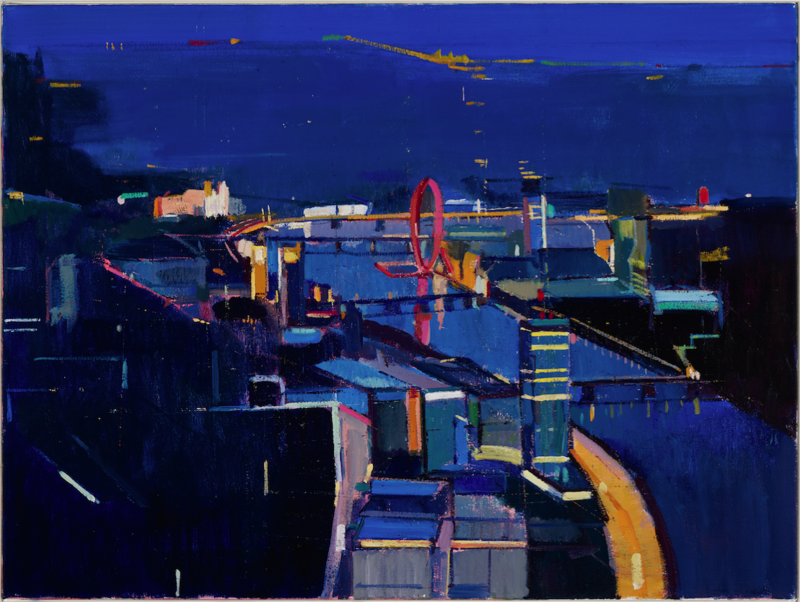 But though his cityscapes are geometric, with hardly a human figure to be seen, the colours are warm, and the stark city environment is suffused with a bold, vivid cheerfulness. 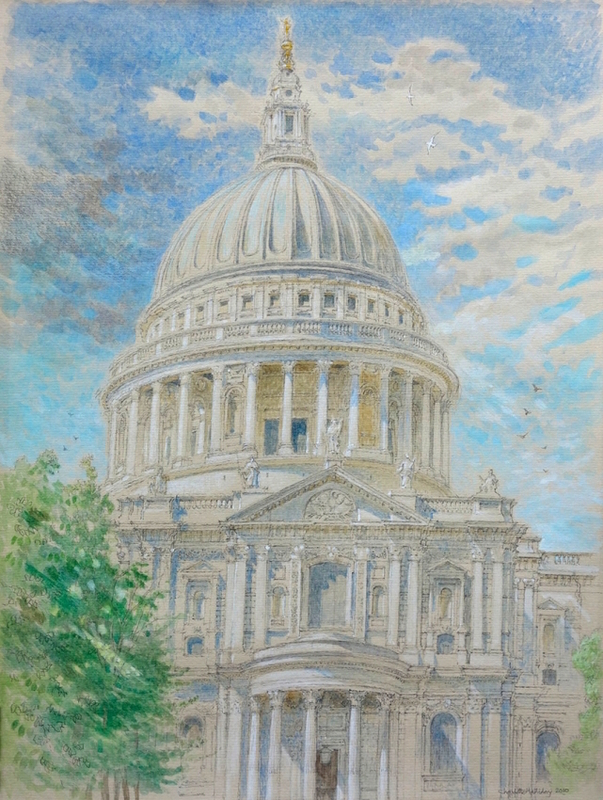 A rather more tender feeling for the city emerges from the meticulous watercolour and pencil studies of London’s public and private architecture by Charlotte Halliday. Born in 1935 and living in St John’s Wood, she is a landscape artist who prefers the built environment to the countryside as her favoured subject. Her drawings and paintings of quiet residential streets and famous London landmarks all display an attention to detail and a delicacy all too rare in contemporary artists. Which may explain why three of her works are now in the Royal Collection. David White, now 79, is the only one of the four who no longer lives in London. 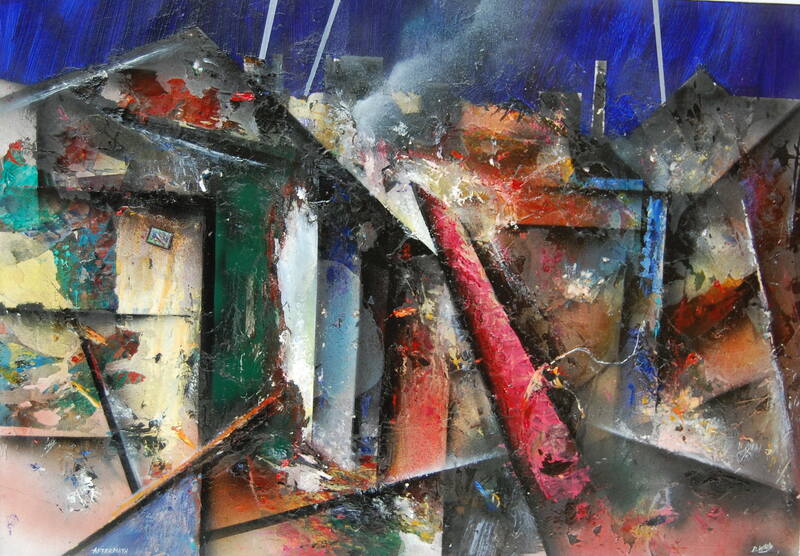 An infant when the Luftwaffe was bombing British cities during World War Two, he became a pupil of the Manchester painter Norman Shacklock, aka David Wilde, whose vivid expressionist style is echoed in David’s own work. He later made his way as a graphic artist and illustrator, occasionally selling his paintings to collectors in London, Paris and Manchester. This is the first time his work has been shown in a public exhibition. Never too late! Venue: Burgh House, New End Square, Hampstead NW3 1LT. The exhibition is being held in Burgh House’s Peggy Jay gallery until Sunday June 24th. The house is open Wednesday to Friday and on Sundays from 12 noon to 5pm.